Robert L. Foster, who contributes articles to Western Americana Blog, has agreed to share the following story with my readers. 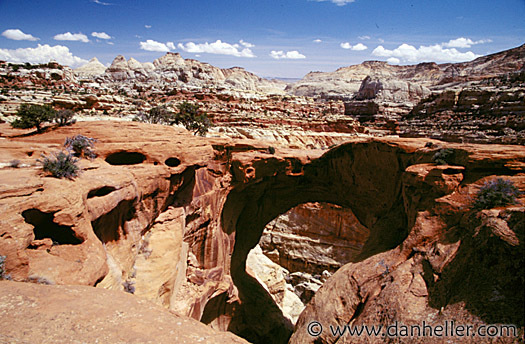 Bob and his fourteen year old grandson, Patrick, traveled by horse back into Eastern Utah’s remote San Rafael Swell. Afterwards Patrick wrote of this experience. It is an uplifting story of one boy’s travel into the unknown, not just the wilderness of Utah, but of overcoming his own limitations. I know they're long gone, now just names in the history books; and no matter how long or far I search I'll never really find them. Yet I'm in their debt! Butch and Sundance, in a round about way, inspired and helped me realize my boyhood dream--to become a cowboy--to saddle and bridle my own horse, to gallop wild and free, feeling the cool desert air in my face, as my horse gallops toward the purple mountains looming ahead. Confidence flows through me, and I feel as though I can conquer the world. However, I don't kid myself or have any fancy illusions that I'm as good a cowboy or as good a horseback rider as you folks who have been riding horses most of your lives. Most of my cowboying has been done through reading books and daydreaming about someday becoming like those hardy western men and women I read about--the ones who live on ranches or farms and ride horses as part of their daily work routine--books like The Outlaw Trail by Robert Redford; Cowboying by James Beckstead with a foreword by Wilford Brimley; or Butch Cassidy by Lee Nelson. In their pages I'm able to escape to another world where the West is fresh and young, where Indians live wild and free, chasing buffalo herds on their Indian ponies. Once in a while I run into a lone buckskin-clothed bearded mountain man riding westward, leading a couple of pack mules. It's not that I wanted my cowboying experiences to come from books and daydreams; I wasn't given much of a choice. Due to a quirk of nature I was born with cerebral palsy and the doctors told my folks chances for my survival were slim to none. But being the wonderful people they are, Mom and Dad sacrificed to get me the therapy and other medical help I needed, to be able to walk by myself across a room without falling headlong on the floor. It's not been easy, but you learn to live with the hand you've been dealt. No big deal. One day as I finished reading Butch Cassidy, written by a prolific Utah writer, Lee Nelson, I gasped aloud as I read the last page of the book's dust cover: "Spend a week riding horseback with Storm Testament series author Lee Nelson through wild back country frequented by Butch Cassidy, Ute Chief Wakara and Porter Rockwell over a century ago. 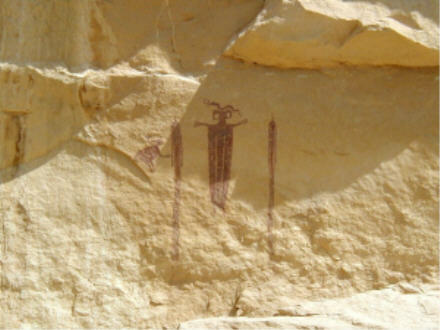 Spend a day riding to remote Anasazi and Fremont Indian ruins and rock art inaccessible to tourists. Spend a day on the San Rafael Desert following one of the free-roaming bands of wild mustangs. Spend a day riding Robbers Roost and Horseshoe Canyon where Butch Cassidy's Wild Bunch hung out at the turn of the century. Spend another day riding through the foothills of the remote and rugged Henry Mountains on the trails of the last free-roaming herd of wild buffalo. You will be assigned a horse suitable to your riding skill, or you may bring your own. You will not be expected to perform beyond your ability..."
Could it be possible? No, I thought. If I called Lee Nelson and he began asking me about myself I'd be finished. He'd never consent to let me ride along, not in my condition. Oh sure, he'd be diplomatic like most folks are to those of us who are a bit different from everyone else; but in the end the answer would still be no. But I couldn't put the thought out of my head; it kept eating away at me day after day. Finally I asked Mom what she thought. "Give Lee a call," she told me, a big smile lighting her face. My voice was a bit shaky when I called Lee Nelson in Mapleton, Utah, where he lives. He sounded like a pleasant enough man and to my surprise his answer wasn't a flat no. He asked if I'd ever ridden a horse before. "No," I answered reluctantly. Then he asked if I had someone who could accompany me. I told Lee my Grandpa Bob was an old cowboy type from Spanish Fork, Utah, and I was sure he'd go. He'd herded cattle when he was a boy and knew a lot about horses. Lee's final answer was conditional. He said, "Patrick, if you can learn to ride a horse by springtime, I mean ride and not fall off, I'd be happy to have you along." Then came the hard part! Spring wasn't very far off and if I wanted to realize the dream of a lifetime I'd have to find someone with horses, who'd be willing to give me riding lessons. I secretly feared no one would want to work with me because of my condition. However, my folks found James Haney, an old cowboy in the Salt Lake Valley, who had some horses, and who figured he could probably have me riding pretty good by springtime. Though my Mom explained to Jim about my handicap I don't think he was quite prepared for the enormity of what that affliction had done to me. I was slightly bent, with an ungainly gait and walked on my toes. Mom and Dad and Grandpa accompanied me on my first visit to Jim's place. He walked over, leading an old saddle mare by the reins. I could tell old Jim was one of a breed we in the West view with affection--the kind I treat with the same respect and interest I would a great artist. The old cowboy introduced himself and asked us to call him Jim. He was bowlegged and an unlit stub of a cigarette dangled from the corner of his mouth. He reached over and began to rub behind the mare's ears. She shuddered slightly as horses do, her flesh rippling back in gentle waves. This act of love seemed rather strange for a man who appeared so rough. He visited with us, the unlit cigarette bobbing up and down as he talked. Trying to put me at ease, he spun off a couple of quick cowboy yarns about his cowboying days. He was a treasure of grit and homilies and I didn't know if he was serious, testing me or just blowing wind. But it really didn't matter. He had such style and humor that I believed everything he said! He summed up everything I'd ever read, heard or imagined about cowboys--rough, colorful, sporty, humorous and valiant and a lover of fun. In his weathered old gray cowboy hat, forehead pale in comparison to the dark tan leathered face below, his eyes fastened intently on me, sizing me up to see if I was up to the ordeal awaiting me. "So you want to be a cowboy?" Jim asked, leading a saddled old sorrel mare over to me. "Yes sir!" I was absolutely delighted to be in a corral, near a real horse for the first time in my life. "Here then," Jim handed me the reins. "This is Old Nellie," he said, patting the mare's neck. "Get up in the saddle and we'll get you started." I took the reins and led Old Nellie over toward the pole fence, surrounding the corral and positioned the horse parallel to the fence and started to climb the poles to get up high enough to get my body into the saddle. "What the hell do you think you're doing, son?" Jim growled as he walked toward me. "I'm trying to get on the horse, sir." I tried to keep the quiver out of my frightened voice. Grandpa Bob started over to help me, but I saw Mom put her hand on his arm. She always wanted me to face life's challenges head on. "Is that how a real cowboy gets on a horse?" Jim asked. "How do real cowboys get on a horse?" "They get on the left side of the horse, put their left foot in the stirrup, their left hand on the pommel, and swing their body up into the saddle." "I can't do that sir," I answered, trying to hold back the tears. "Can't? Can't? Did I hear you right? Can't? What do you mean you can't? Don't you want to go on the expedition with Lee Nelson?" "Well, that's more like it. Get over here and let's get you up on Old Nellie!" I walked the horse over to Jim. "Put your left foot up in the stirrup," he commanded. I tried to lift my left foot up into the stirrup, but my leg only came half way to reaching it. I groaned at the pain shooting through my body from such a high lift, and bit my lower lip until I could taste blood in my mouth. "Hey, buddy, that's good," Jim grinned encouragement. "Just a little higher next time." But damn, the pain was killing me! Even in physical therapy I'd never lifted my leg that high. I glanced over at my Mom and saw her fingers pressing into Grandpa's arm. If my Mom's love was a physical force I'd already be mounted on the tall, patient horse. Jim was standing behind me. His strong left hand encircled my thin ankle. "Let's do it boy!" Amazingly my foot was somehow in the stirrup and Jim's hand was in my back so I wouldn't fall over backwards. "Grab the pommel, boy, you're gonna do it!" Sweat beaded my forehead as my left hand found the pommel, and using every ounce of strength my body possessed I slowly pulled myself upward, gritting my teeth at the excruciating pain penetrating every nerve of my body. My right leg was miraculously off the ground and I was lifting it over the horse's back. "Just a little bit more," Jim shouted, moving his hands upwards to give me a final shove. Mom shook her head and Jim backed off. "You're on your own now, cowboy. C'mon, throw your leg over. You can do it!" My right leg went over old Nellie's back and down her right side and found the stirrup. And I'll be damned! There I was, sitting tall in the saddle, smiling down at Jim, my folks and Grandpa Bob. Dad and Grandpa whistled, shouted and cheered while Mom blew me a big kiss! "I did it Jim. I did it!" I shouted excitedly, scarcely able to contain myself. At that moment I knew this was the most significant achievement of my lifetime. "You surely did, boy! You most surely did!" The tough old cowboy took a red bandanna handkerchief from the back pocket of his faded Levis and blew his nose. "Something in the air," he told me. "Go ahead, cowboy," Jim said, proudly looking up at me. "Take her for a walk around the corral. Get the feel of the saddle. Hold those reins up and show 'er who's boss." From February to late May Mom and Dad took me to Jim Haney's farm once a week for riding lessons. Jim called me Tenderfoot most of the time, but one day he told me with a sly wink, "by spring you'll be riding with the best of 'em." I really liked Jim. He treated me as he would anyone else, never letting me fall back on my handicap if the going got tough. That old cowboy reminded me of military drill instructors I'd seen on television and heard about from my Dad, who'd been in the Army. I could tell my Mom was really nervous about me going on the expedition with Lee Nelson. One day, when I was walking my horse back to the barn, I overheard Mom and Jim talking and I caught the tail end of their conversation. "He'll be alright," Jim said. "It's not that, Jim," Mom said, touching his arm. "It's just that..."
"Kinda hard to let go, huh?" Jim interrupted, threw his cigarette on the ground and stepped on it. "He'll be just fine. He took to this cowboying like a duck to water. He ain't fallen off or been throwed since that first time back in February." Mom still didn't sound convinced. "You really think he'd be alright. He'll be gone a whole week out in that wild country..."
"Hell yes, he'll be just fine. Your Dad is going along. He'll watch after him. It'll be the best thing that's ever happened to Patrick." spends a full year traveling and gathering information for a book. We left Lee's farm with the horses loaded on four horse trailers, pulled by four 250 series pickup trucks and headed east to Huntington, Utah, where we turned off into the arid, remote San Rafael Swell, thousands of uninhabited square miles of rugged canyons, mesas and mountain peaks. When we arrived at the San Rafael River we found a nice spot under some tall cottonwood trees along the river and set up camp. We unloaded the horses, saddled them, and rode back into a deep canyon where Lee told us Butch Cassidy had hidden on occasion. Once, after a robbery near Price, a posse was chasing him and his men. Unknown to the posse from Price, another posse from the Huntington area was also on the trail. When the two posses rode into each other they started shooting. Butch and his gang got away and the posses gave up and went home. It was a scenic ride along the river into the canyon. I got some good pictures of an old fallen down cabin that Lee thought was one built by Butch and his men. I was riding a big horse called Nebraska and my Grandpa Bob was astride a large stallion called WJ. The trails were narrow, some almost straight up and others almost straight down. I could tell Grandpa Bob was nervous for fear I'd tumble out of the saddle. From Nebraska's back to the ground was a long ways! When we returned to camp for the evening Grandpa said, "you rode today as though you were born to be a cowboy." The camp cook had supper ready, dutch ovens full of barbecued chicken, potatoes with cheese topping, rolls and blueberry cobbler for dessert. That chicken was delicious. I had six pieces! As the sun set we stoked up the campfire and sat mesmerized as Lee Nelson told us about Robert LeRoy Parker, a boy from Circleville, Utah, who later became known as Butch Cassidy. 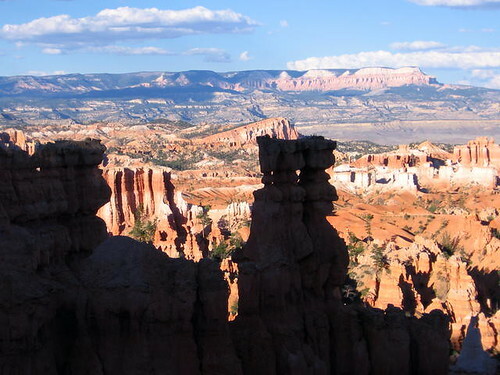 There, under a star lit Utah sky, with campfire smoke wafting over us, I felt as if we'd gone back in time a hundred years, and at any moment Butch Cassidy and the Sundance Kid might come galloping into camp to welcome us to the San Rafael country. The next day we loaded up the horses and traveled about an hour east, and stopped to search for wild burros. There were hundreds of fresh tracks all about. We broke into small groups, each group searching a different area. Grandpa Bob and I rode together for about two hours into some remote canyons, but couldn't find the burros. We knew they must be back in the trees watching us. The wild burro herd is a remnant of the herd the Spaniards brought to the area back in the 1600's. We traveled on and crossed the Muddy River. After setting up camp we saddled up and followed the river for several miles into some of the most remote country in the West. We crossed the river twelve times. Lee pointed out where Fremont Indians had grown corn, squash and other things along the river bed. We climbed a very steep trail to a high wind-swept mesa where we surprised a herd of wild mustang horses grazing on top. The stallion leader gave out a high-pitched neigh, almost a scream, and the herd ran wildly east into a box canyon! We had them trapped and to get out they'd have to run right past us. We were ready with our cameras, and sat our horses in silence. Here they came, hell-bent-for-leather, kicking up dust, their manes flying, and they passed within 100 yards of us--and me with no telephoto lens. The wind was blowing pretty hard, like it does atop mesas, and my new Stetson cowboy hat blew off. Because it's difficult for me to dismount, Grandpa whipped down out of the saddle and retrieved my precious hat! Grinning, he took out his pocket knife and said he'd punch a couple of holes in it so I could use a small piece of rope as a strap to hold it on. Not a good idea, Grandpa! Nobody punches a hole in my Stetson! Lee Nelson's hat blew off and rolled along the ground at about thirty miles an hour. We all tried, but none of us could retrieve the hat. Lee was hatless the rest of the day! We did many other things on the expedition--went swimming in the river, gathered some flint arrowheads and spearheads as well as stone scrapers and pieces of pottery. They were just scattered over the open ground as though they may have been dropped by migrating Indians. We stopped by some petroglyphic Indian writings near Rochester Rock, which is a long ways back on a very rough rocky trail along a slab-sided hillside. There were petroglyphys everywhere! Lee told me if I bent sideways and looked cross-eyed, I would be able to see some pornographic petroglyphys. I dismounted and looked over to see if Grandpa was watching me. He was looking the other way so I snuck a quick peek. I bent down, and looked cross-eyed, and by damn there were some rather raunchy petroglyphys. But I wasn't quick enough. Grandpa caught me in the act and burst out laughing. Lots of other things happened which made this experience one I'll remember all the days of my life. Most memorable though is when we got back to Lee's home he invited Grandpa and me into his den. He presented us both with a copy of his latest book, Porter Rockwell. He autographed mine, writing I was a magnificent cowboy! He'd ride any trail with me anywhere anytime. Coming from Lee that meant a lot. I guess I really was getting the hang of being a horseback rider! I didn't find Butch Cassidy nor the Sundance Kid, though I could almost sense their presence in that magnificent San Rafael Swell country where they spent so much time eluding lawmen. But they helped me find myself! Nothing is too difficult if you're properly motivated. Often, when life's challenges weigh heavy on me, and I don't think I can make it any further, I remember that old cowboy who helped me learn to ride a horse. "You can do it, boy!" Lee Nelson was such a dear friend on the expedition and I learned a lot about life from his wise philosophy--and of course it goes without saying, being with my Grandpa Bob, on a horseback ride into history, was an opportunity, most boys never have. Note of Interest: Patrick finally got his driver’s license when he was 22 years old and was ecstatic that he could at last drive a motor vehicle! So he bought a new Dodge Ram 1500, which helped turn his mother’s hair gray with worry! He decided if he could drive a big pickup he could go to college! He decided to major in history. Patrick knew it would be extremely difficult, especially mathematics—but with the help of a patient tutor, Patrick completed four years at the University of Utah and graduated on the honor roll, with a bachelors degree in history in June, 2005. He is now enrolled to begin the fall semester, 2007, at the University of Washington to work on his Master’s degree.